Want to hack some of the priciness off cat skiing? [R157R, Grand Targhee Resort] is once again offering its early season snowcat packages. The packages provide a way to snowcat ski or ride by going early in the season and paying less than a regular day of cat skiing. The resort is offering two early-season snowcat packages. A three-night package with one day of lift-accessed skiing and one full day of snowcat skiing starts at $277 per person. The four-night package includes two days of lift skiing and one full day of snowcat skiing starting at $329 per person. Cat skiing and riding at Grand Targhee uses 600 acres of slopes on Peaked Mountain. Runs average about 2,000 vertical feet. Most groups get in 10-12 runs per day. Of course, you can also go cat skiing at Grand Targhee any time during the season. A full day of snowcat skiing costs $349 per person. A half-day trip, which lasts three hours, costs $199 per person. The resort also rents powder boards and skis, so you don’t have to fly with gear. The Grand Targhee Rental Shop and Demo Center carries a broad selection of equipment specifically designed for powder. 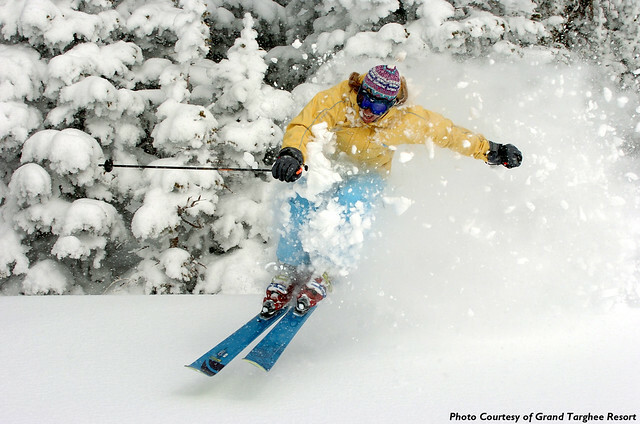 Grand Targhee recorded 583 inches of snowfall last season. Photo Courtesy of Grand Targhee Resort. Opening day at Grand Targhee is scheduled for Nov. 25, conditions permitting. Early-season snowcat packages are available from opening day through Dec. 22. Advanced reservations are required for snowcat skiing and riding. To make reservations, call 800-TARGHEE. Find out more here.